If you believe that in the Carpathians you can only go skiing and there is nothing to do in the summer here – you are very mistaken. In addition to beautiful mountains’ places, waterfalls and villages you can have a terrific time in the mountains trying one of the many bicycle routes. 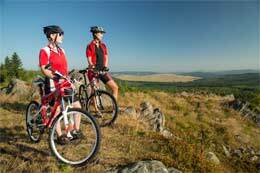 In our today’s article we give the information about the most interesting routes in the Carpathians, which can be passed by bicycle. The route starts from the central market. Its start is similar to the route 305. At the crossroads of the routes 305 and 306 (see Description of the route 305) we go straight. Then we reach the river bridge and go across it. The asphalt road ends and at the same time the first rather lengthy climb begins. The main thing is to known your own strengths. After climbing for a while we come to the village Bahrivets. Straight away after climbing a short descent follows, after which we go along the rural road to the second and the last ascent. Ascent surface is a mixture of rocks, soil and clay, so it is not so easy to go up, especially after rain. But a reward for your effort will be incredibly beautiful landscapes at the top of the hill. 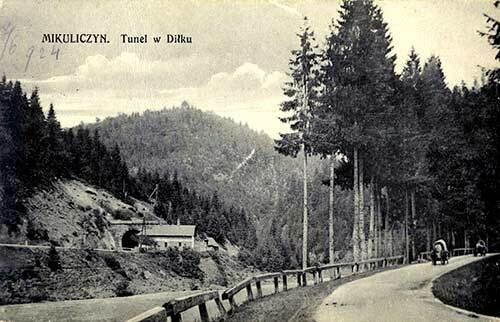 Then the steep descent along the asphalt road to the recreation Carpathians waits for us. Passing the recreation we go along the main road and having crossed the bridge, short of the highway we turn left to a quiet street leading us to the restaurant Hutsulshyna and souvenir market. Also, you can swerve to the left from this road and reach the meadow with the healing spring near the river, where you can spend time. It is a short, not difficult route. The route starts from the highway near the market in the center of Yaremche. Here we tern off the main road and go up to the market, after crossing the railway we turn left and go along the asphalted road. Then we reach the crossroads: the route 306 goes straight, the route 305 turns to the right. We turn right to a small ascent covering with concrete slabs. There is another crossroads at the end of the ascent: the road to the left is the direction to the waterfall Maiden’s tears. We have to turn left. The surface becomes earth-stone here and goes on up to the waterfall. Next we go to the rest complex “Bears’ Mountain”, and then to enclosures where you can rest and watch deer and boars. Then we continue our journey straight up to the waterfall. It should be noted that the greatest part of the route goes through the forest and is in shadow most of the time, so swamp can be left even a week after the rain. Later we go through a small and not deep stream. Then we go on the main road up to the crossroads where we need to tern to the left. After the short descent we are almost at the goal of our trip – the waterfall. To the waterfall we should go down on foot. It is a great place for bathing in a hot day. There is also a beautiful summer house where you can sit down and rest. We go back the same way we have come. It is an interesting route that allows you to see Yaremche quite in a new light. Cozy streets, the Prut River with its rocky banks, ascents and descents, forests and city views wait for us on our route. The route starts from the market, then we go to the highway, turn to the left and in a dozen meters we go off to the right as the road sign shows. We follow carefully the signs and soon we come down to the bank of the Prut River, where you can refresh yourself and rest a little. Next we go on the path along the bank, pass a small stream and go back to the central road. We go to the left and approximately in 20 meters we turn right, where the more interesting part of the route starts. First we go up along the asphalt road, then move higher and higher, until the asphalt road changes to the earth road and leads us into a small forest. In the forest the road turns sharply left and goes up again. Climbing for a while, we find ourselves at the top of the route where we can stop and admire views of Earache. The route goes on along a horizontal road. We have to follow the signs in order not to miss the turn after which a steep interesting stone descent begins. At the end of the descent we go to the finish point of the route, which is in the same place as the start. The route can be overcome also in the opposite direction. The quiet, not difficult route suits for those who want to have a nice and useful time. The route starts from the railway station in Tatariv. Then we go along the road to the side of Yaremche. In about 3 km before the bridge over the Prut River there is a pointer to the waterfall Huk. Alternatively you can go a while longer on the highway and cross the river over a hanging bridge. Here a smooth ascent until the very waterfall begins. First the road has a good asphalt pavement, but in time it goes into the earth-stone road. On the way we meet estates of Ukrainian officials, in particular, Yushchenko’s summer cottage. Perhaps because of this fact the route has got its name. At the end of the route one of the most beautiful waterfalls of Ukraine – Zhenetskyj waterfall with height of water falling in 11 m waits for us. We go back in the same way. It is an interesting route of medium complication with beautiful views of the Carpathians. The route starts from the railway station of Vorokhta. First we take the route 315 (see Description the route 315 – Under the old bridges) to the village Voronenko. Then we continue our travel along the route 313 (see Description of the route 313 – Yablunytsja’s horizon). At the end of the ascent there is a crossroads near the church: the route 313 turns right, and we go to the right. The road always goes straight through rural pastures. Here you can admire the picturesque views of the Carpathian ranges, in particular of the mountain Khomiak. Later we climb to the highest point of the route, where we turn right and go down the road that leads us to the center of Vorokhta. This route is for those who want to see Bukovel in a new light. The route starts at the central square. Next, we go up along the parking. We cross the skiing track and go down the asphalt road. We go to the reception, where the interesting serpentine ascent begins. At the end of the ascent we cross the wide skiing track N2 and go down to the road. We go back to the central square. It is a short, but nonetheless interesting route around Yablunytsa. If you want more to admire the views of the Ukrainian Carpathians, more to rest and less to pedal – this route is just for you. From the highway we go the new way towards Bukovel, but we do not speed up too much, because in 100 m we need to turn left at the first of two ascents of this route. The ascent is not long, so it does not take a lot of energy. Next we go down the earth road and turn left. Then we go along the road and after 600 m we turn left on the second ascent of the route. This ascent is longer and heavier than the previous one, but you can do it. At the top you can find a place for a rest and observe the neighborhood. Next we need to go left and after 150 m we come out to the main road and go back to our starting point. It is an easy pleasant route, which runs mainly on the asphalt road. The climb is negligible and practically imperceptible, so this route is suitable for beginners and for those who just want to relax. The route starts close by the cemetery near the Prut River. Here we turn off the highway. The road is quiet without significant movement and goes in the beginning through the residential area. In time there are fewer buildings, and the road changes sometimes into the forest one. We go always straight, without turning anywhere. At the end of the route there is a beautiful meadow near the river – a great place for relaxing and swimming in the warm season. If you wish, you can continue the journey: down the road you can see oil fields existing up to now. We go back the same road. Everybody who seeks adventures, who does not desire to spend one day more by sitting at the computer or TV – this route is exactly what you need. There will be everything: protracted climb and steep descent, forest roads and open meadows with endless views. 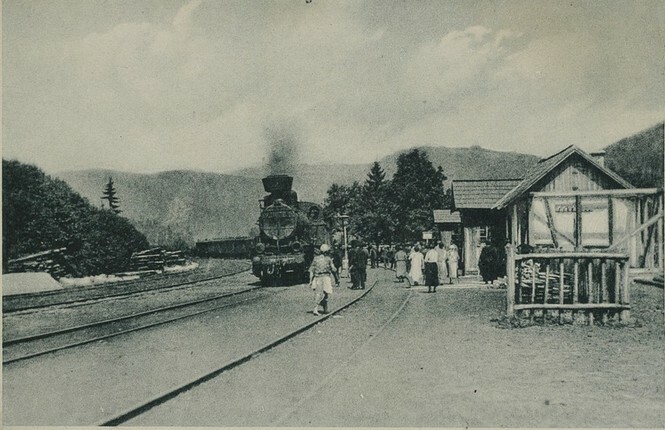 The route starts from the railway station in the village Voronenko. You can start from Vorokhta, but in this case you get the village Voronenko using the route 315 (see Description of the route 315 – Under the old bridges). From the station we go along the track till the ascent. The climb takes the long time therefore we go at the moderate pace to our goal, which is the mountain Kukul. The first part of the ascent is quite steep, besides the road is partially worn down by timber carriers, but having reached the ridge the road turns to the left and then our climb up to the mountain Pid-berdia becomes smoother. Here we can rest, admire the incredible views of the Ukrainian Carpathians, including the highest point of Ukraine the mountain Hoverla. The rest of the route will be much easier than before. We continue our travel along the ridge towards the mountain Kukul. Reaching the mountain valley Labjeska, the road turns left to the final part of the route – the descent to Vorokhta. Here you decide whether you have enough strength and inspiration to win the mountain Kukul. Alternatively, you can leave someone with the bicycles at the foot of the mountain and to climb the mountain by foot. The 10 kilometer descent to Vorokhta brings you unforgettable impressions that you will keep in your mind as a pleasant memory for a long time. The only place that should not be missed is the crossroads approximately 2 km after the start of the descent. There is an ascent to the mountain Kychera to the right, and a traverse road to the left. We have to turn left, that will be enough climbs for today. The route starts in Vorokhta. The first part of the route runs similar to the route 315 (see Description of the route 315 – Under the old bridges). Reaching the village Voronenko and crossing the track we turn right. Here the climb begins. First, the gradient is small, but the farther, the steeper it becomes. Before reaching the church we overcome the last meters of the ascent. From the church we turn left and rest a little when going the almost horizontal earth road. After a few hundred meters, the “main” road turns right. We go along the ridge where formerly the state border followed, and now it forms the border between Ivano-Frankivsk and Transcerpathian regions. Soon we get the mountain valley, which opens very beautiful views, especially on the mountains Petros and Hoverla. You can rest here a little. Next there is a short but sufficiently steep descent and we go on the highway, which goes through the Yablunytsia pass. Those who want to visit the Transcarpathian region can go to the left hundred meters along the road. The route goes right along the highway. Then we go about 4 kilometers and follow closely the signs in order not to miss a turn to the right. We go down to the earth road. We go along it, then take a left and reach the ridge with a good earth road. We follow this road along the ridge up to the top station of the longest chairlift in Ukraine. Then the most interesting part of the route begins, namely, an exciting, a bit extreme and very technical descent down to the lowest point of the lift and from there we go the way across the bridge and get to Vorokhta.